Shravan (Sawan) Month - Why is Sawan Mahina the holiest month in the Hindu Calendar? / Why is Shravan(Sawan) Month the holiest month in the Hindu Calendar? Why is Shravan(Sawan) Month the holiest month in the Hindu Calendar? But why is this month called Shravan? It is believed that on Poornima or a full moon day or at any time during this month, the Shravan Nakshatra or star rules the skies and hence, this month derives its name from this nakshatra. The Shravan month is synonymous with auspicious festivals and events. It is the best time to conduct all-important religious ceremonies, as almost all days in this month are auspicious for shubh arambh, i.e. good start. Shravan maas’ ruling deity is Lord Shiva. 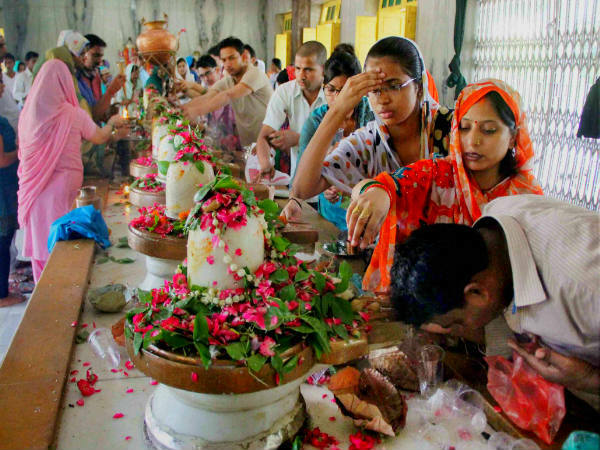 In this month, each Monday is celebrated as Shravan Somvar across all temples with the Dharanatra hanging over the Shiva linga, bathing it with holy water and milk, throughout the day into the night. Devotees offer Bael leaves, flowers, holy water and milk, i.e. Falam-Toyam, Pushpam-Patram to lord Shiva on every Shravan Somwar. They fast until the sun goes down and the Nandadeep, the Akhand Diya, burns throughout. The Samudra Manthan is a very important episode as per the Puranas. The churning of the milky ocean, i.e. Samudra Manthan in search of the amrit, took place during the month of Shravan. During the churning, 14 different rubies emerged from the ocean. Thirteen rubies were divided among the devas and the asuras, however, Halahal, the 14th ruby remained untouched as it was the deadliest poison which could destroy the whole universe and every living being. Lord Shiva drank the Halahal and stored the poison in his throat. Due to the impact of the poison, his throat turned blue and he came to be called Neelkantha. Devout devotees of Lord Shiva consider it auspicious to wear Rudraksha in the month of Shravam. Mondays are dedicated to Lord Shiva as his the ruling deity of the day. However, Mondays in the Shravan maas as known as Shravan Somwar and are highly auspicious, and celebrated with all austerities. Offering milk to lord Shiva in Shravan Month leads one to earn a lot of punyas. Wear Rudraksha and use it for japas. 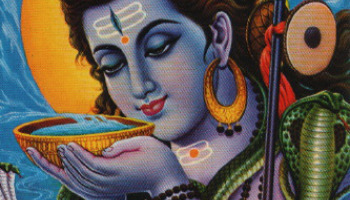 Bhibhuti is considered very important if offered to lord Shiva. Some of it should be smeared on the forehead as well. Chant the shiva chalisa and perform regular aarti of lord Shiva. Chanting the Mahamritunjay mantra is very auspicious. Fast on all Shravan Somvars. This is important for young women seeking good husbands.